A Massachusetts mother of two who thought she had a simple cold is dead after flu-related complications turned fatal last week. Jenny Ching, 51, of Needham, was admitted to a local hospital on Wednesday, Jan. 3, when her cold-like symptoms grew worse, The Needham Times reported. Doctors diagnosed her with influenza. Ching died Friday, Jan. 5, just two days after she was admitted to hospital, the Times said. Ching worked at the New Garden restaurant, a popular Chinese spot in Needham. He expressed his condolences on behalf of restaurant staff in a social media post. Her wake on Wednesday reportedly drew hundreds of people. Tom Keating, a veteran, posted, “Such an outpouring of support for the Jenny Ching family tonight. The lines of people at the Eaton Funeral Home was literally around the corner. Our VFW Post members each presented a white rose to Jenny’s casket, saluted and then visited with her husband and Dennis and David, her sons. Michael Raymond posted on the Needham, MA page “Amazing outpour from the community in the freezing cold. “Waited out in the cold for 45 mins, been inside for another 45 mins and still only halfway thru the line. 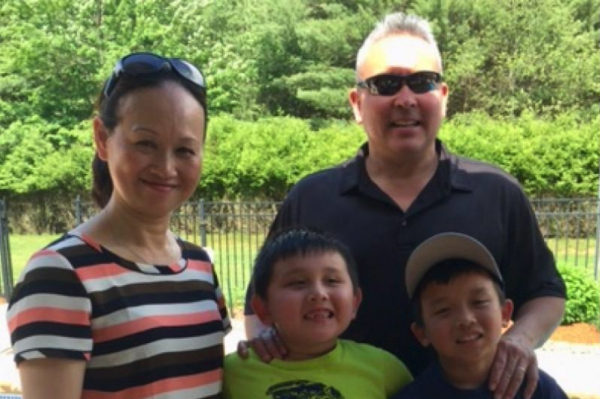 A GoFundMe page has been set up to help Ching’s children and family. She leaves behind her husband, Matt Ching, and their two young sons.